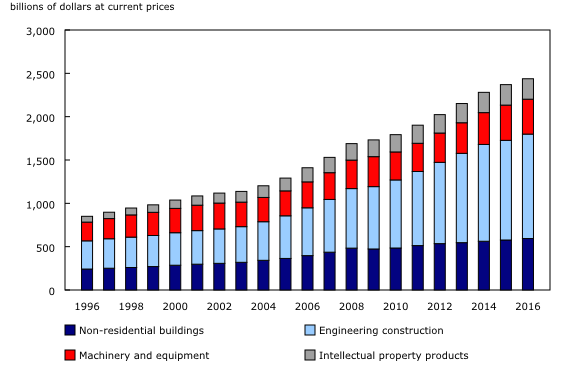 Non-residential capital stock, which is made up of building and engineering construction, machinery and equipment as well as intellectual property products, was 0.9% higher in 2016 compared with 2015. The stock of non-residential engineering construction rose 2.1%, following a 3.2% gain in 2015, while the stock of non-residential building construction increased 1.1%. Engineering construction is the construction of assets such as roads, bridges, waterworks and oil and gas production facilities. The stock of machinery and equipment fell 0.9% in 2016, after decreasing by 0.3% the previous year. Industrial machinery accounted for most of the decline. The stock of intellectual property products was down 2.0% in 2016. Mineral exploration and evaluation led the decline, as was also the case in 2015. This was the second annual decline after five consecutive years of increases. When calculating capital stock, a decrease in the stock occurs when the amount of depreciation exceeds the flow of new investment. Non-residential capital stock rose in eight provinces and one territory. 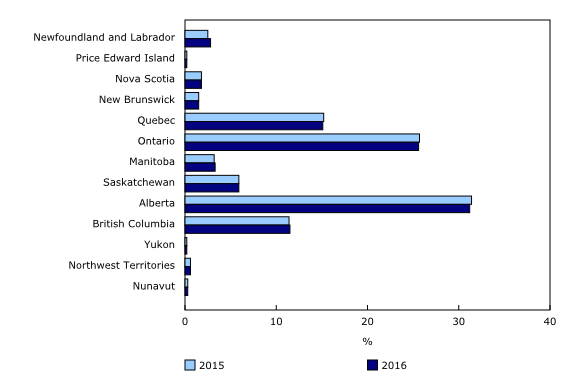 As in 2015, Newfoundland and Labrador had the strongest growth in 2016, at 10.7%, the result of an acceleration in non-residential engineering construction, followed by Manitoba (+4.1%), Nunavut (+1.9%) and Nova Scotia (+1.3%). The capital stock decreased in Prince Edward Island, New Brunswick, Yukon and the Northwest Territories. Although Alberta recorded a deceleration in its capital stock expansion, the province continued to hold the largest share of Canada's total non-residential stock in 2016 (31.2%). It was the second straight year of declines in Alberta's share, due to lower investment in the oil and gas extraction sector. Other than Alberta, Quebec and Ontario were the only provinces posting declines in their shares of total non-residential capital stock. In 2016, Newfoundland and Labrador posted the largest increase in its share of Canada's non-residential stock at 2.8%, compared with 2.5% in 2015. The increase was mainly the result of the development of the Hebron offshore oil project and the Muskrat Falls generating facility. In 2016, 24.4% of total non-residential stock in Canada was held by the government and non-profit sectors, a slight increase from 2015 (24.3%), while 29.1% resided in the mining, quarrying and oil and gas extraction industries. For almost half of the provinces and territories, more than one-third of non-residential capital stock was concentrated in the mining, quarrying and oil and gas extraction industries. In 2016, these industries accounted for 69.3% of non-residential capital stock in the Northwest Territories; 64.6% in Nunavut; 61.1% in Alberta; 50.9% in Newfoundland and Labrador; 47.6% in Saskatchewan; and 34.7% in Yukon. Residential capital stock, which consists of new residential construction, renovations to existing structures and transfer costs, rose 2.9% in 2016, the same growth rate as in the previous year. Overall, residential capital stock reached $2.2 trillion in 2016. Over two-thirds of the increase was the result of investment in the construction of new homes, while the remainder was due to renovations on existing residential structures. With the exception of Nunavut, every province and territory posted a gain in 2016, led by British Columbia (+5.0%) and the Northwest Territories (+3.8%). Meanwhile, residential stock in Nunavut edged down (-0.2%). This was the first time the territory reported a decline. This release reflects revised estimates of investment flows and prices in accordance with the latest revision of the Canadian System of Macroeconomic Accounts. The classification of non-residential capital stock is based on the final demand classification used in supply and use tables. Estimates of non-residential and residential investment, depreciation and the associated net stocks are available by geographical breakdown on a current price basis, 2007 constant price basis (2007 asset price = 100) and chained (2007) dollar basis. Non-residential estimates of depreciation and stocks are available by industry and by asset, using linear, geometric and hyperbolic methods. Residential estimates are available by type of investment using geometric methods. The System of Macroeconomic Accounts module, accessible from the Browse by key resource module of our website, features an up-to-date portrait of national and provincial economies and their structures.